This recipe is a wonderful alternative to traditional fat-laden refried beans. Lentils are incredibly nutritious and loaded with soluble fiber, and red lentils in particular can be more tolerable than other varieties as they have little insoluble fiber. Use a mild chili powder for flavor without heat. Finely chopping the onions and garlic breaks down their insoluble fiber before you even eat it, and cooking both of them off-gases their sulfur as well. 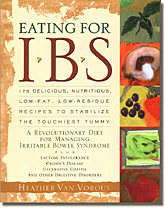 Both of these steps make onions and garlic much safer for IBS. Try this spread with baked corn chips, tortillas, or as part of a Mexican meal. In a medium saucepan combine lentils, water, cumin, chili powder, garlic salt, and Tummy Fiber. Bring to a boil, whisking frequently with a metal whisk, and cook until smooth, about 40 minutes. While lentils cook, saute onion in oil in a large non-stick skillet until onions are golden. Add garlic and cook, stirring, five minutes. Add lentil puree and lime juice and combine well. Top with cilantro, and serve with baked corn chips.